Rocal who are based in Barcelona have for over 30 years been manufacturing a unique number of designer stoves. These are excellent handcrafted stoves balancing, beauty, high efficiency and low CO emissions. They stand out with their unusual contemporary design unseen in most other brands. 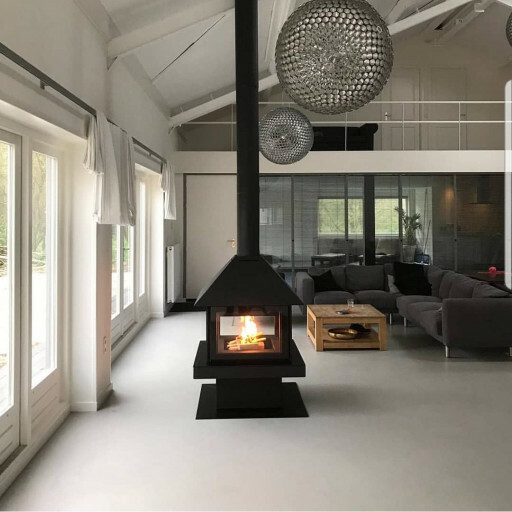 The free standing Giselle 90 is another winning design from Rocal which perfect for the centre of a room or as a room divider for all to gather around and enjoy the heat. All four doors open on the stove with automatic closing on the loading door. With a nominal output of 17.6kW this makes a fabulous centre fire to heat the whole room.